Yesterday I attended the Book Blogger Conference at the RT Booklovers Convention. Even though I was sick, I still managed to learn a lot and meet some great people. 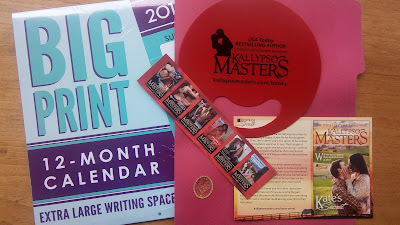 I also picked up a lot of cool author swag. I thought I would spread the love and share some swag. So I am hosting a giveaway featuring one of my favorite bookmarks, some organizational goodies from Red Reading Republic and swag from Kallypso Masters. This giveaway is open to U.S. residents (void where prohibited) who are over 18 years of age. Please see the giveaway widget for complete terms and conditions.